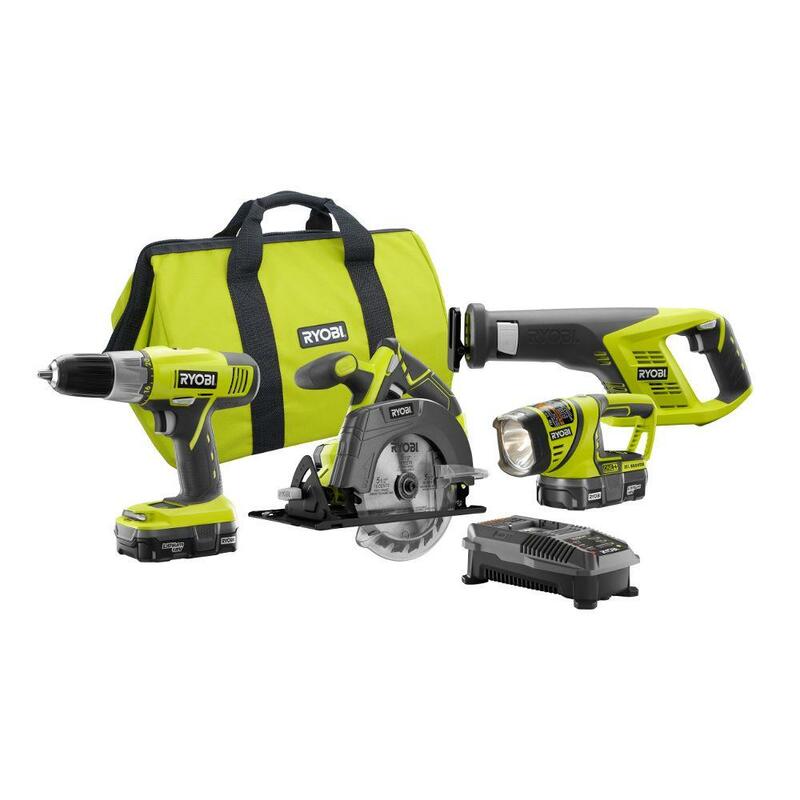 Seldom has a comprehensive cordless power tool kit been so affordable! This do-it-yourself RYOBI Super Combo is chock-full of ONE+ 18-Volt lithium-ion devices that will turn chores into hobbies. The variable-speed reciprocating saw in this bundle includes a blade with a 7/8 in. stroke length capable of 100 SPM. A multipurpose carbide-tipped blade comes with the 5-1/2 in. circular saw, capable of carving through 2-by material and sheet goods at speeds up to 4700 RPM (no-load). A keyless chuck secures 1/2 in. bits into the lightweight drill, a variable-speed device that allows the operator to select one of 24 clutch settings for optimal torque. Never lose sight of your projects with the included ONE+ work light that can be positioned on its belly, rear or hung from above with the ability to rotate and point the head where desired. Shipping is FREE to all addresses other than APO/PO boxes in the lower 48 states. Our stock all ships from our US-based warehouses. Shipped via USPS or UPS (depending on location and package weight) Unless stated otherwise, all orders will ship within 24 hours of your payment being processed. Check our feedback to see the great reviews of FAST shipping we offer. PAY SAFE: PAYPAL PAYMENT IS ACCEPTEDWe offer a 30-day return policy for our products. Items can be returned for exchange or full refund within 30 days from the date you receive your merchandise. We are not responsible for any purchase after this 30-day period. Return shipping is the responsibility of buyer unless the return is a result of our mistake . We will pay for shipping replacement back to you if an exchange is requested. If you have any questions please contact us through "Ask seller a question" link. We will respond within 1 business day or less. All returns must be done within 30 days of the date of purchase. Please note that we cannot give refunds after the 30 day limit has expired. When sending in a return, please note that it can take up to 7 business days for the return to be processed. We do our best to process as quickly as possible. DELIVERY TIMESDomestic lower 48 free shipping is expedited. We have many different shipping locations depending on the product you buy and the shipping location that you choose. We try to ship most items within 24 hours of payment Monday-Friday. Most orders are in transit for two days but some may take longer. If you have a specific time frame please contact us before you make the purchase.